Mission: The Eye-Camera project’s goal is to advance the science of the bionic eye and assistive medical devices for individuals who have lost vision in one or both eyes. A recent start-up generated from the public response to a Call for Engineers to help a one-eyed woman’s plight to regain vision for her left eye that she lost in a car accident. ➢ Technology to advance the bionic eye. ➢ Medical Assistive devices for the visually impaired. High quality imaging, wireless, sensor, and communication capabilities. Looking for ways to heal trauma; EyeTanya is a multi-disciplinary approach to transformation. EyeTanya are captured moments (photography & video) rediscovery of sight, peripheral empitness, and what revelations can come out of acknowledging what we take for granted. The journey of recovery from trauma in the United States is convoluted with debt, bureaucratic institutions, societal ignorance … EyeTanya are words of self-documentation (writing & video) of this process, while the stigma is deep …EyeTanya are also images (photography) parodying and defying labels of disability in an effort to free oneself by reinvention. And finally through performances and time-capturing devices (live multimedia performance, writing, & feature length film) EyeTanya is a model to mythologize oneself by creating one’s own story for a future identity. 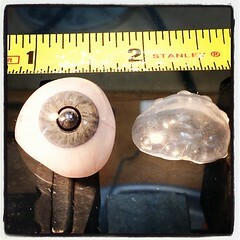 I am attempting to recreate my eye with the help of a miniature camera implant in my prosthetic / artificial eye. The intraocular installation of an eye-cam will substitute for the field vision of my left eye that I lost in 2005 from a car accident. While my prosthesis is an excellent aesthetic replacement, I am interested in capturing on the current advancement of technology to enhance the abilities of my prosthesis for an augmented reality. Bridging new technology to vision and an experience of mediated reality to express new ways for storytelling and imagery. A true point of view project installing a camera in a prosthetic eye will challenge ways in which we document cinema verite, and will also inevitably provoke dialogue around rights of privacy, surveillance, and transhumanism. The eye-camera project while controversial, is also a means of transforming a loss into a gain. We are now sponsored under Fractured Atlas. This means that EyeTanya now has 501(c)3 status and can apply for grants under the umbrella of a non-profit organization.